Combine Family Stories, Pictures and Sound into a Highly Organized, Media-Rich Journal, Diary or Memoir! 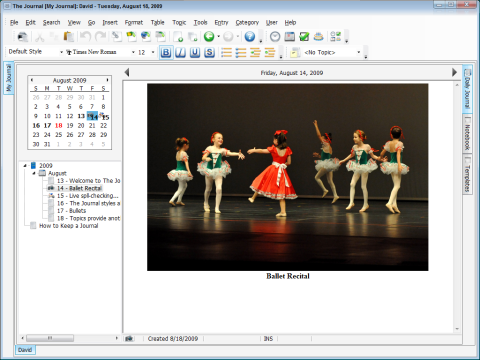 The popular lifestory workbook, called Memorygrabber, now comes as a set of pre-loaded questions and prompts in journaling software. That software is simply called The Journal. It's the perfect tool to keep a diary and/or journal in! 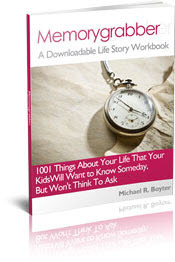 Writing your lifestory or autobiography is easier now because of it. Let Memorygrabber spark memories and simply record them into your copy of The Journal. Memorygrabber is the very popular life story e-workbook that has been used and praised by people throughout the world and has been used as a life story writing tool in retirement communities, grade schools and even select classes at Duke University (Instructor Cynthia Clarke; 2002). Memorygrabber been available in e-book form, for over thirteen years, and still is. Learn more about Memorygrabber HERE. What is new though, is that it now has much greater function, ease of use and ability to assist you in gathering your personal history or family history (stories) in its combined form with The Journal software. The Journal has been featured in Personal Journaling Magazine and considered "best of class" in the world of personal journaling software. Click Here for features of The Journal . The Journal has been available in separate form previously, but now Memorygrabber'slifestory template has been added into your copy of The Journal. This means you will never have to look at a blank screen, having run out of things to write about your life story or about. Just refer to the Memorygrabber templates and you will instantly be reminded of plenty more to tell about. CLICK HERE to Go to The Journal Download Page! No longer do you need to print out Memorygrabbers's pages and write your responses by hand, although this is still an option. 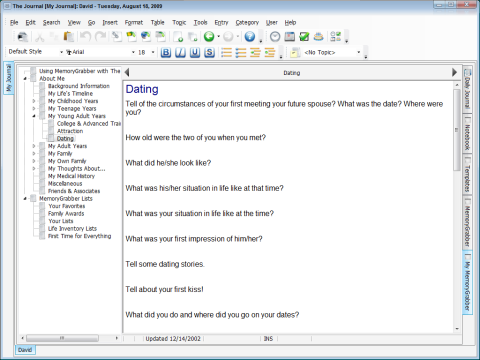 Over the years, the overriding suggestion from Memorygrabber users has been to make it possible to type answers directly onto the computer screen. This is finally possible with combination of The Memorygrabber and The Journal Software. No longer be limited by how much space you have between questions on the printed page. Memorygrabber presents you with close to 900 writing ideas, questions and prompts (combined) and now, being part of The Journal, you'll have near unlimited amounts of space to respond and tell your lifestory or family history. Since most can type faster than they write, you'll get much more said and preserved... faster! Don't let embarrassment of less-than perfect handwriting prevent you from preserving and passing on the stories of your life to your children and grandchildren. I don't believe you should be concerned about this anyway, but I know many people do worry about it. Problem solved! If your spelling is suspect, no one will be the wiser! Place pictures of exact events right into your writings/stories. 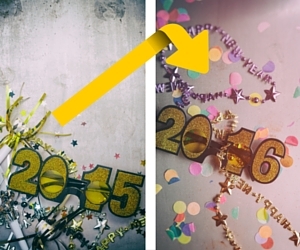 Pictures can tell your story much better in the mind of the future reader. Show them the house you grew up in…instead of just trying to describe it. The fun part is deciding which pictures to include. Insert a picture and tell about it. This is where Memorygrabber comes into play. Memorygrabber will give you an arsenal of nearly 900 questions to answer and memory lists to create. Pick and choose the questions you wish to answer... and delete the rest. You will never again be able to say "My life hasn't been that exciting so I can't think of much to write about". These questions and list-building activities are integrated right into into The Journal as templates. Consider these questions to be just like a personal interviewer creatively asking you about your life. You'll have more to say/write about than you would have imagined! Blank Journal pages will still be available to you, should you desire to start from one. At any point, print all or some of your compilation into a book format for sharing with family, right from your own printer. Create an unlimited number of categories, sub-categories, entries and sub-entries to keep your writings neatly organized and tightly put together. You'll organize your entries by date, year or however you wish and never have to flip through screens, like pages in a paper journal, looking for that one special entry you wrote previously. 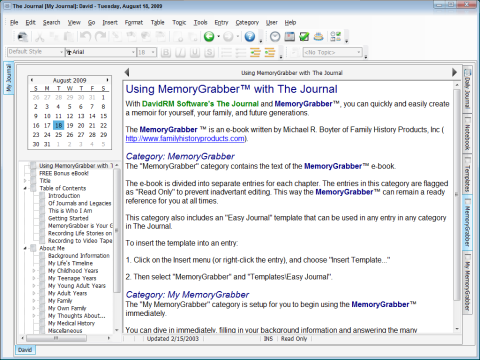 Memorygrabber/The Journal gives you no hassle lookup ability with supreme search function. Preserving your personal history will be much easier with this kind of organization ability. A lack of organization kills any type of project, including writing a journal or life story. A free version of the e-book version of Memorygrabber will be sent via download to each purchaser of The Journal/Memorygrabber combination. You will receive download information after you order. What If I Already Own The Journal? If you already own a previous version of The Journal and would like to add the Memorygrabber module for $14.95 to your Journal program, please use the above link as well. .
To Purchase only the Memorygrabber E-book, use this Link! CLICK HERE For Customer Reviews, More Screenshots and Additional Details About The Journal!